An expository essay is one of the four main modes of discourse. Most of the papers you will write in high school and college will be expository in nature. It simply means that you will be required to identify a subject, research it, construct a thesis, and then develop a method of analyzing the data to substantiate your thesis. In this article, we’ll examine the ways that you can write a really great expository essay! 9 Want Help with Your Essay? Here are some simple questions that you can ask to better understand the expository essay and its focus. How should it be defined? How did it happen, or what was its cause? What was its cause and effect? The expository essay is an essay form that facilitates the discussion of the fruit of investigation. In other words, if you do research on a topic, this essay genre allows you to present your findings. It is helpful to note that there are a variety of forms that are expository in nature—so there is no one way in which an expository essay must be written. For instance, your expository essay can be written as a compare and contrast essay, a cause and effect essay, or an explanatory essay. The expository essay can lay out the particulars of an argument, explain a concept, evaluate information, define an idea, or analyze a process. It is different from an argumentative essay because the purpose of exposition is more about giving the reader understanding than it is about convincing the reader of a specific point or argument. The expository essay is not an exercise in persuasion but rather an exercise in laying out all the facts for the reader. What the reader then does with those facts are beside the point. The main goal of an exposition is to give information to the reader. Writing an expository essay is easy. First, you need to identify a subject. Choose something you either know a lot about or something you would like to know more about. Then start researching it. Collect as much information on the subject as you can. Take notes and use these notes to construct an outline. In your outline, you will want to identify a thesis statement—the main point of your essay (what you are trying to show). This will give you the focus you need to complete your essay. Compose your opening paragraph. This will be your introduction. Your introduction should use a hook to get the reader’s attention. It should then provide some background information that feeds into your thesis—which should come at the end of the introduction and set up the body of the paper. A typical 5 paragraph essay will consist of an introduction, three body paragraphs (supporting paragraphs that bear out the thesis), and a conclusion. The body of the paper should focus on supporting the thesis. If your essay is about riding a bike, the body will likely focus on what equipment is needed for safety, how to balance, and how to use the pedals, handle bars, gears, and brakes. If your essay is about comparing and contrasting President Kennedy to President Obama, the body will likely focus on similarities and differences of the two. The body of the essay will differ depending on your thesis and the form that your expository essay takes. The format for this essay will be similar to any other essay: your citation style will impact how the paper is formatted (see here for how to format a paper in MLA and APA styles). The method of the expository essay will determine how the paper’s construction is developed. If the essay uses the compare and contrast method, it will have a different structure than if it used the cause and effect method. Determining the method will determine the structure of the expository essay. The basic expository essay outline should consist of an introduction, body, and conclusion skeleton. The introduction portion of the outline will focus on how your essay is being set-up—the form that is being used and the thesis that is being communicated. The body will focus on identifying the supporting points that will bear out the thesis. The conclusion will focus on wrapping up the essay and re-iterating the purpose. Your outline doesn’t have to contain a lot of details—just the main direction points. a. Hook: Your Twitter app alert just went off! Quick check your phone! b. Information is conveyed instantaneously today, directly from the source to the recipient—no middle man needed. c. Journalistic filters are therefore playing less of a role in the transfer of information on a global scale. d. The digital citizen has arrived, thanks to informational blogs, social media sites like Twitter and Facebook, and the video-sharing site YouTube. i. How it has freed up information: publishing houses no longer have control over what gets published; now anyone can get info out to the public. ii. Sharing information is now easier than ever: bloggers provide links and comments that allow readers to connect. i. Facebook and Twitter have revolutionized how information is spread. ii. Users follow sources of information and cut out middle men and filters. iii. Social media has helped to create the digital citizen. i. How it has changed the way information is processed. ii. Podcasts (people interviewing people) are shared on YouTube and allow information to be communicated quickly. iii. YouTube has helped to create the digital citizen. a. Information is shared via many different, digital channels today. b. Social media, blogs and YouTube have helped create the digital citizen and reshaped the way news communication is conducted. The “blockchain” is a new type of digital tool that many people are talking about. It has uses in everything from ledger keeping to digital currency creation. Explain how it works along with the positives and negatives it brings to the table. Fraternity brothers and sorority sisters are often friends for life. They can help when it comes to establishing relationships, networking, and finding a career. So how does one obtain these friendships? Research this subject and summarize the processes involved in joining. Methods of treatment for depression can vary depending on the approach adopted by the counselor and the needs of the patient. Tell which methods work best for which situations. What are the ways for preparing for an exam? You can do an all-nighter cramming, or you can set aside a little time each day to go over notes. You can form a study group and help yourself and others to prepare, or you can go it alone. Determine the various ways of studying for a test and tell about them. Compare and contrast various styles of martial arts. Karate, taekwondo, kung fu—these are just a few. Each has its own special traits. Comparing and contrasting them can help highlight what makes each unique. What is the evidence for and against climate change? Look up both sides of the issue and explain what scientists say in support of and in opposition to global warming and the theory of climate change. This revolutionary technological breakthrough could be the future of engineering—or it could be a bust. What are people saying about 3D printing and what advances has it made so far? Pontius Pilate asked, “What is truth?” See if you can answer him by researching what philosophers have said about truth throughout the ages. What are the arguments for and against the existence of God? Evaluate the merits of the two sides to the debate of whether a higher supernatural power exists. How does a movie get made? What goes in to producing a film? Research the process of filmmaking from scriptwriting to post-production and explain the genesis of a movie. How do the multiple plot lines of Shakespeare’s Merchant of Venice interlink? The bond plot, the ring plot and the casket plot all tell a story in Shakespeare’s famous comedy. Tell how they connect and drive the overall narrative to its completion. How have the theories of leadership evolved over the years? From the “Great Man” theory to the University theories, ideas of leadership have developed over time to consider traits and environments as critical factors. Explore this development and explain how the theories of leadership have developed. Is there evidence that Orwell’s 1984 is happening in real life? Research the ways that Orwell’s vision of Big Brother has and has not come true. Describe several aspects of society that show how the real world “Party” uses lies to control and manipulate citizens. Describe ways that the “proles” are still able to resist and counter today’s Big Brother. What is the epidemiology of the Zika virus? Where was it first discovered? How did it travel? What brought it to America? Research the history of the virus and find out how it came into being. You can also view more essay topics here. “War is hell.” That’s what Gen. William Tecumseh Sherman said during his destructive campaign against the South in the American Civil War. It was also the title of a 1961 film by Burt Topper. The horrors of war have been addressed by many films throughout cinematic history. From First Blood to Paths of Glory to The Thin Red Line to Born on the 4th of the July, films have looked at what makes war tough and what makes coming home even tougher. So while Gen. Sherman put it bluntly and best, this paper will explain how three war films of the modern era have shown the casualties of war on the silver screen. Stanley Kubrick’s 1957 film Paths of Glory, starring Kirk Douglas, showed how terrible the front lines of combat can be and how unjust, dictatorial commands from out of touch authority figures can weigh on the soldiers. Douglas carries the film with his staunch and upright insistence on morality, but he is no match for the powers that be, who insist on executing three randomly selected soldiers to make an example to the rest of the men that cowardice will not be tolerated. The sacrifice of the three selected begs the question, “What is the point of all this?” The sacrifice does nothing to motivate the men. Instead, the song of one German girl, delivered in a barroom to a room full of rapt American soldiers who have no idea what she is saying, gives the real message: they are fighting a supposed enemy, yet clearly the enemy is not the one on the other side of the lines. The enemy is within. No film gets to the heart of this question as well as Terrence Malick’s The Thin Red Line. Loosely based on a novel by James Jones, The Thin Red Line tells the story of a group of soldiers battling for a hill in the Pacific. The film plays more like a poem rather than a war movie. It asks questions along the way, such as, “What’s this war at the heart of nature?” and “Why does nature vie with itself?” The characters drift in and out of the story, and the viewer is left with fragments of passing thoughts, recollections, prayers and interactions. The manner in which Malick approaches the subject of the war is compelling and prompts the viewer to consider life from the aspect of death and to seek a way towards the peace that passeth all understanding. If “war is hell” as Sherman once said, the films Paths of Glory, First Blood, and The Thin Red Line all show why this is true. Yet each does so in a different way, emphasizing different aspects of real life war and how it can impact human beings. The films expertly show that the horrors of war are real and should be considered. Hopefully, upon considering them, we can find alternative solutions to our problems and work to be better human beings. One of the most important decisions you will make in life is deciding on what you will major in at college. The reason this is so important is that it sets your career path. If you major in music, you’re more than likely going to be looking for a job in the music industry. If you select information technology, you’re probably going to go for a job in IT somewhere. If you want to pursue a career in law enforcement, a major in criminal justice will probably be what you want to take up. If you want to be a nurse, it doesn’t make much sense to major in poetry. Usually a person’s career choice will dictate the major one selects. But what happens if you don’t know what career you want to follow? To choose a major, it is not necessary that you know what career you want. Instead, you choose something that you want to know more about. Forget about passion. Go for knowledge. Devote yourself to a major that you can grow with. Use the time in college to really learn something new: if you are passionate about art but would like to know more about how the world works, consider majoring in economics. Your passion will always be there; so focus on gaining new knowledge. You are there to learn. Another way to choose a major could be to identify the traits that best characterize you. Are you good at math? Are you good at writing? Are you good at computers? Take note of what your skills are. Your skills can help you to see what you might like to do with a major. Remember, a major is what allows you to get your foot in the door when it comes to applying for a job. You can also choose a major by simply spinning the wheel. If life is a wheel of fortune, you might as well play the game. Give it a spin and go for the major that comes up. It’s better to make a decision—any decision—than to flounder and flop around, never deciding at all. In conclusion, a major is very important in life. You’ll want to choose the right one for you because it impacts so much of what comes later. However, if you don’t know which to choose, there are several methods to help you make your decision. You can go for something you know little about, go for something that best fits your character, or select something at random. The point of the expository essay is to explain something. Each of the two examples above does exactly that. The first explains why “war is hell” using movies as the approach. The second explains how to pick a major in college. Both identify their respective topics in their thesis statements, which come at the end of their introductory paragraphs. And both begin with good hooks that catch the reader’s attention. The essays also use their body paragraphs to support their main ideas and explain the subject fully to the reader. The conclusions summarize the topic and reiterate the main points, bringing the reader up to speed in a concise and succinct manner. 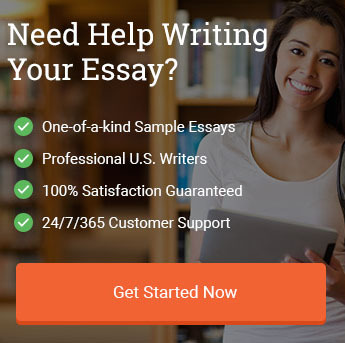 Want Help with Your Essay? If you need help writing your own expository essay, you can try our essay writing service. Our writers are all native-English speakers with advanced degrees who have been providing model essays for clients for many years. In other words, we’re professionals: we’re in the business of teaching students by way of example. So you may have a great idea or know your topic and have the research ready to go—but when it comes to actually putting the words and ideas together, you’re struggling. Our writers construct every essay from scratch, using the detailed instructions you provide to tailor it so that it meets your precise needs. We don’t recycle old papers. We make them fresh like pies at a Mom-and-Pop. You want to write the best essay you can write. We want to help. Our 100% original model essays have been used by students for years: they show them the way forward by example. See how a professional would write if he was in your situation—then you can feel more confident going forward. Try us out today! An expository essay is one in which you focus on researching a subject, explaining it, defining it, describing its causes and effects, or comparing and contrasting it with another subject. There are, in short, many forms that can be used to write this type of essay. As one of the four main modes of discourse, it is a genre of writing that you are sure to encounter in your studies. In fact, the expository essay is one of the most popular types of essay. It requires research, because the point of the essay is to show the reader something. However, it is not a type of essay in which you are required to convince the reader of something. The purpose is not to argue a certain line of thought or disprove a certain theory. The purpose is mainly to provide the reader with information, whether that is through utilizing the compare and contrast approach, the process analysis approach, the cause and effect approach, or the definition approach. The choice is literally up to you. Just remember to select a topic that you are interested in. Create a thesis that you can support throughout the body of the essay. And use an essay hook to grab the reader’s attention. Use sources to back up your paper and reference all material at the end. Get to know your subject by doing research. Use your sources to support the thesis that you develop. The form you use for your expository essay will determine how you go about shaping the essay. Always cite your sources and reference them at the end of the paper. "How to Write an Expository Essay." Aceyourpaper.com. Student Network Resources Inc, 26 October. 2017. Web. 20 April 2019. Student Network Resources Inc. "How to Write an Expository Essay." Aceyourpaper.com. 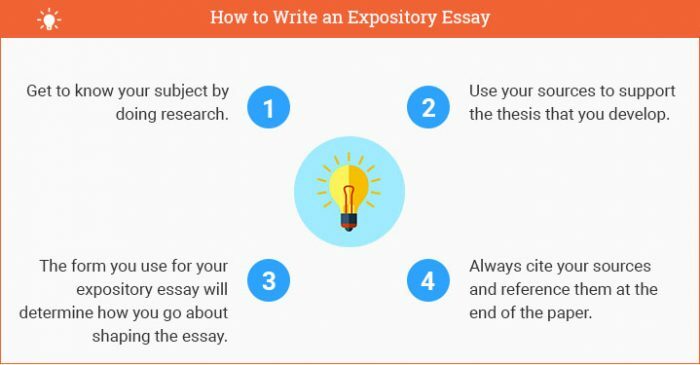 https://www.aceyourpaper.com/essay-writing/expository-essay/ (accessed April 20, 2019).